Napa sets are chock full of fabulous ingredients like wine, grapeseed oil, honey, aloe vera & french clay to keep your skin smooth and nourished. 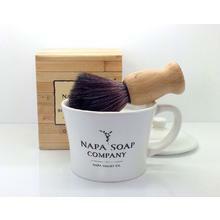 They are great on the Earth too as one of these shave mugs contains about a year's supply of shaving soap. As always they are handmade in the Napa Valley. Economical, earth-friendly and skin-friendly. Combining her interest in the environment, aromatherapy and a prolific supply oflavender, Sheila discovered that soap offered a natural outlet for her talents. After researching the therapeutic benefits of a by-product of the local wine industry, cold-pressed grapeseed oil, Sheila decided to use this wonderful ingredient throughout her line. After nearly two years developing the right combination of essential oils and natural ingredients, Sheila started to sell her Napa Soap Company products to select accounts here in the Napa Valley. Napa Soap is hand made in very limited quanties-less than 50 bars at a time. 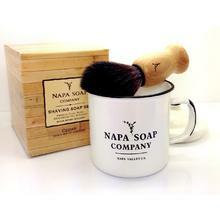 Enjoy Napa Soap Company products! Since we have 3 small children growing up in our community, a portion of our proceeds are donated to the Boys and Girls Clubs of St. Helena and Calistoga, a nonprofit organization committed to serving the needs of school aged children in the upper Napa Valley. At Napa Soap Company, we care about the environment and we hope you do to. Here are some of the things we do to help keep in line with our goals. We strive to use as little packaging as possible and are firmly committed to reduce, reuse, and recycle as much packaging and packing materials as possible. As such, you might notice quite different boxes, packing materials, etc. used in the shipment of our items. We hope you appreciate the intent behind this practice and also join us if you have not already in this effort. We use organic ingredients whenever they are available to us. We try to create minimal packaging to create less waste. Our lotion and liquid soap labels are printed on stone paper, a brand new material made from crushed excess stone from granite and marble quarries and recycled plastic. Absolutely no trees are used which means more trees for us to enjoy! We test our products on humans, not animals! We are recycling fanatics in our production facility and office. We use paper and packaging made from recycled materials. We are happy to take your shipping materials off your hands if you are unable to use them such as peanuts, bubble wrap and cardboard boxes. We reuse these items to ship our products. We create refills and bulk products to reduce packaging and waste. We support companies and products with the same Earth Friendly ideals as ours. We maintain a 2 mile stretch of highway in the Napa Valley keeping it free of litter and debris through the Adopt a Highway program. Maybe you will see us out there keeping it clean as we like to say! Although the ingredients used to make soap have changed over the years, the chemical process which creates soap has not. Basically oils and fats are combined with an alkali to create a reaction (saponification) which produces soap and glycerin. The quality of the ingredients you use has a significant effect on the final product. A theory exists that prehistoric cavemen may have been aware of a crude form of soap. Cavemen typically roasted their meat over open wood fires. The fat from the meat would drip into the fire, mix with the ash (an alkali) and after a good rain, voila--you have foaming bubbles coming out of your campfire. Whether or not they realized the usefulness of this reaction is not known, but it is an interesting theory. The first records of soap indicate that the Babylonians were making it around 2800 B.C. However these first soaps were thought to be used for cleaning textiles and fabric rather than the body. Soap for bathing the body seems to be credited to both the Romans and the Celtics who may have both independently discovered the benefits of hygiene around the beginning of the second century. Soapmaking dramatically progressed around the 8th century in Italy, Spain and the southern parts of France when soapmakers began making soap from olive oil. These soaps were clearly superior for bathing and washing compared to those made elsewhere, and the result was a lively trade with Northern Europe. In the 19th century, Louis Pasteur confirmed the benefits of personal hygiene thereby increasing the demand for soap. Later during the same century an English marketing wiz named Andrew Pears helped define soap as a cosmetic aid which made it's users "beautiful". Bathing came back into fashion and the demand for soap was higher than ever before. Today, soap is as much a part of life as air and water, and there are many different types available. Unlike our ancestors, we are more fortunate to have so many more choices of what we elect to use on our skin. So choose wisely and enjoy!